Both the front and back yard in our new house need a lot of work. We’ve already had 11 trees removed and the stumps grinded down which has ruined the little bit of grass we did have and next spring we are hoping to grade and reseed the entire lawn. 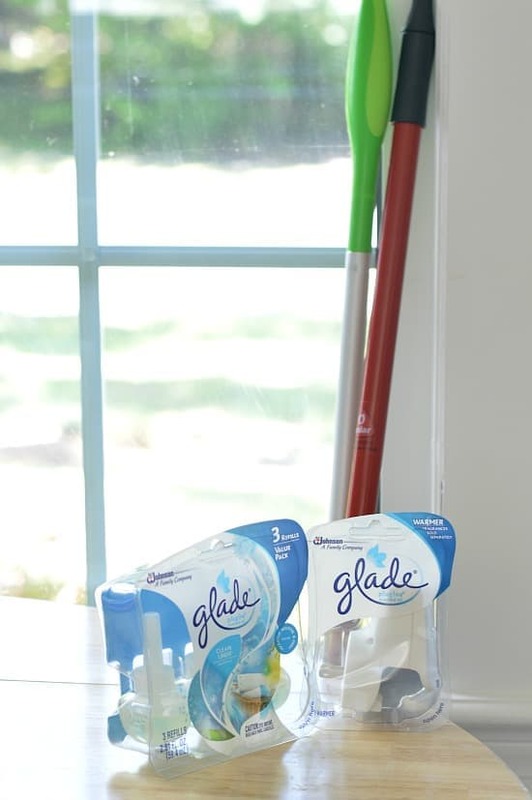 Recently, I partnered with Glade® to create a simple summer DIY project. Initially, I wasn’t sure what simple thing I could make that would improve the look of our outdoors. I decided to sit back, pop a Glade® Hawaiian Breeze® Wax Melt into the Wax Melt Warmer, and get thinking. The scent of fragrant tropical fruits, pineapple, and plumeria had me daydreaming of a vacay almost instantly, but I was quickly brought back to reality when a great idea popped into my head. I decided to build a sweet little DIY wood planter box for both the backyard and front steps. I’m loving the rustic character they add – and they took only 30 minutes to make and came in at the grand sum of $10 a piece! I picked up all my supplies at my local Home Depot. 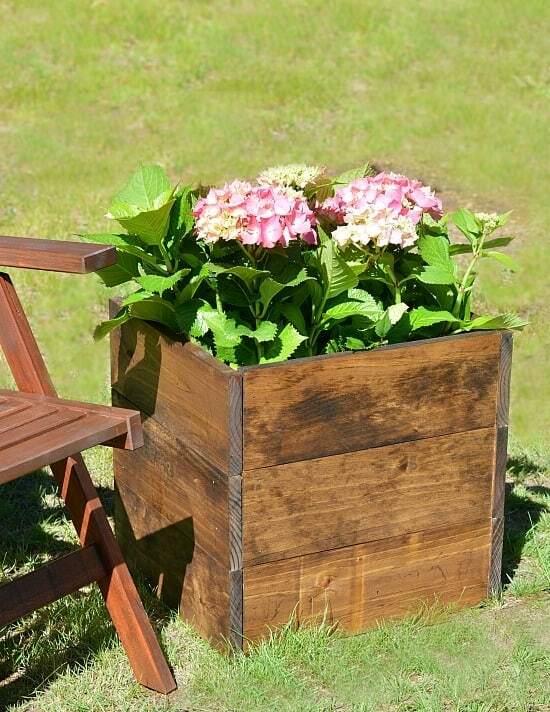 You’ll need some two 1 x 6 boards and one 2 x 3 board to make this 16 inch planter box. I had to go during the week sans hubby, so trying to find the correct wood and check that they weren’t warped – all the time trying to keep my toddler happy – was a bit of a challenge. Luckily, the folks that work at the Home Depot are super awesome and helpful! By the time I got home, lugged my supplies into the garage and got the baby back into the house and down for a nap, I was pooped. Then the doorbell rang. I peeped outside to see an unfamiliar face – one of my new neighbors most likely. The house wasn’t exactly spotless but I quickly grabbed my Glade® Room Spray and gave the living room a few quick sprays. 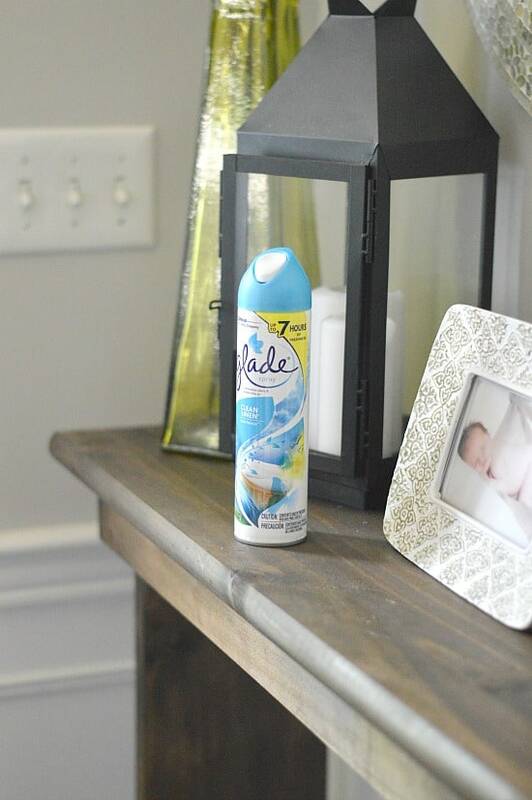 Glade® Room Spray eliminates odor and freshens the air, making your home uniquely inviting for all. Each is infused with essential oil extracts and comes in a variety of fragrances ensuring yours will always be an open home. I personally love the Clean Linen® scent – I mean who doesn’t like the smell of fresh laundry with a citrusy twist? Eventually after a quick hello and a promise of a summer BBQ, I was able to get down to work. 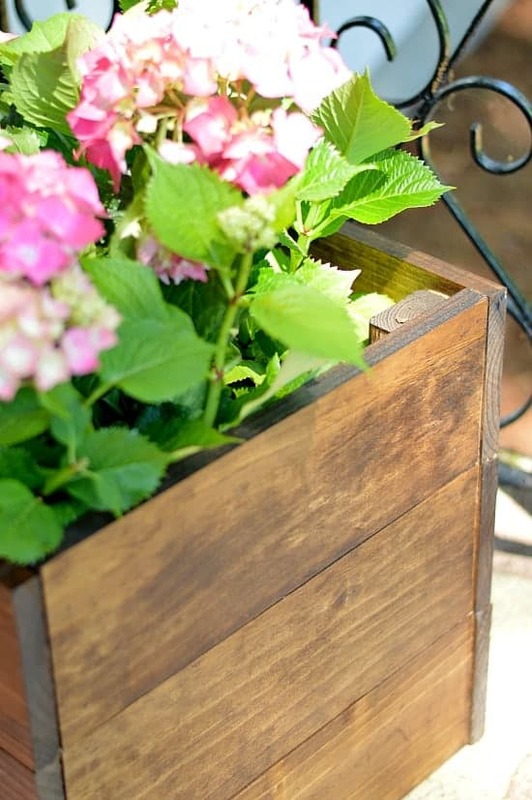 By the way, this DIY wood planter box was so easy to build that even if you’ve never cut a scrap of wood in your life, it will turn out great for you! Plus, you can make them in half an hour, which is great, if, like me, you have to get all your work done during naptime! I used pennies to space out the boards but it’s up to your whether you want a tight fit or a little gap. For the second side, attach the 3 1 x 6 boards to the outside edge of the 2 x 3. Keep repeating this process until your box is built! Then apply a stain of your choice (or keep it natural) and seal with a Spar Varnish which will provide weather resistance. You’ll notice there’s no bottom to this planter – it’s more like a sleeve. By all means, flip it over and add one! Personally, I like to just pop pots in there and since no one will see the bottom, it works just fine! I picked up two beautiful hydrangeas from Home Depot and popped them right in. The stain is the color Provincial. It’s a perfect warm brown, and the same color we used on our hardwood floors! The planter box adds the perfect amount of rustic, farmhouse charm our front steps. Aren’t the hydrangeas simply stunning, too? 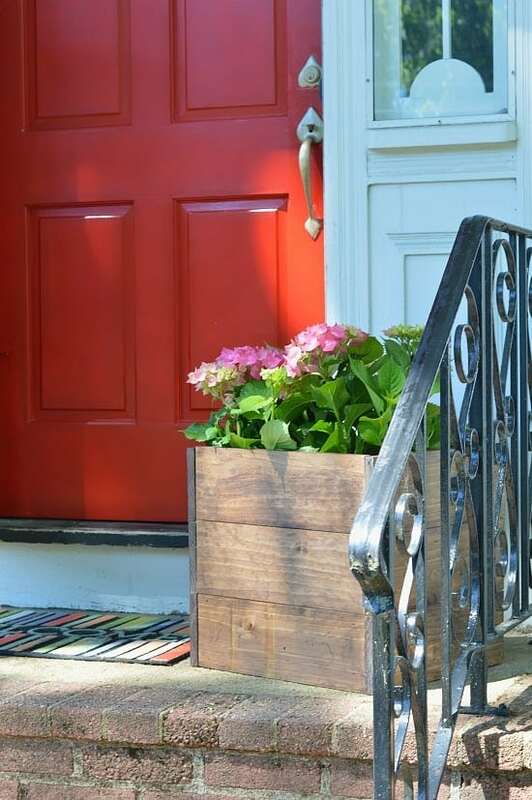 Of course my DIY wood planter box doesn’t only look great on the front steps. I built a second one and created a little area for myself in the backyard. This would be perfect if you had a patio or a deck, too! At least that’s one little project I can check off my outdoor list! 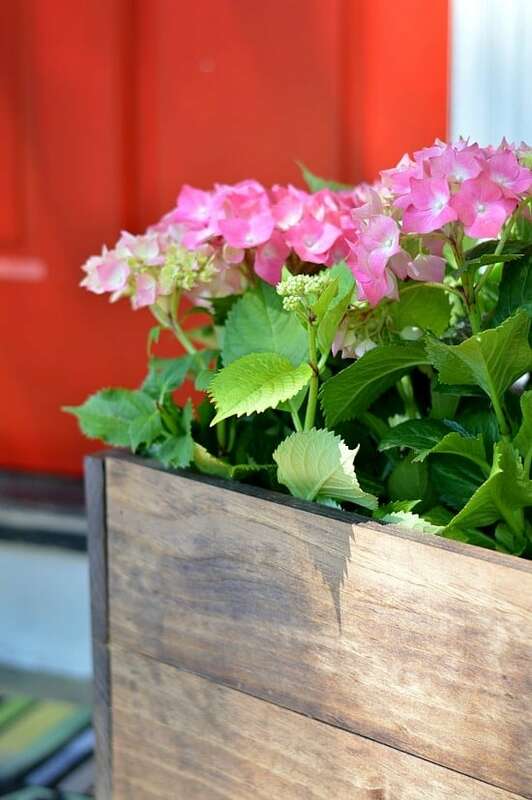 Will you be making your own DIY Wood Planter Box? It’s a great first DIY that adds some serious curb appeal! Right now, I’m off to plug in my Glade® PlugIns® Scented Oil (again in my favorite Clean Linen® scent!) and get my house spick-and-span before I start another interior project! I grabbed all my essentials for this post at the Home Depot. Want your home to smell great no matter what? Check out Glade’s social media accounts for lots of great ideas and products!